The past few years have seen a lot of news coverage of Russia in regards to sports. Following the 2014 Winter Games in Sochi, the doping that marred the Rio and PyeongChang Winter Games, and their successful bid to host the 2018 FIFA World Cup, it seems that Russian athletes and sports culture, in all its dramatic scandal and glory, are everywhere. 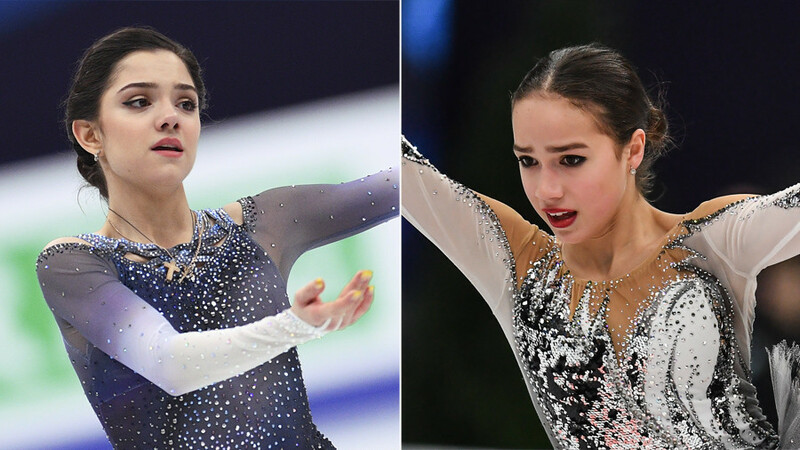 Medvedva and Zagitova, the two Russian rival figure skaters who captivated international audiences in PyeongChang. The two young athletes took home the silver and gold, but without the Russian flag. Source. But this isn’t the first time that Russian sports have drawn international attention. In fact, since the Soviet Union’s powerful debut at the 1952 Summer Games in Helsinki, the world has been captivated by athletes from Russia and the former USSR. More than six decades later, modern Russia seems to be deeply preoccupied with athletics, with the medal counts and the doping scandals to prove it. 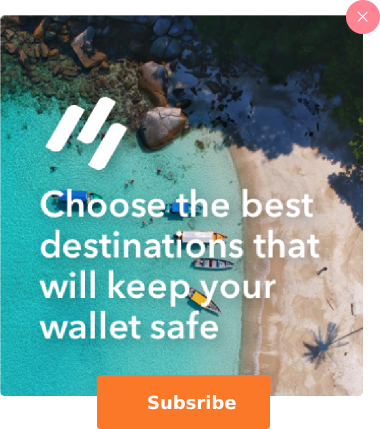 To be sure, many nations the world over are fascinated by sports and have their national pride riding on high-profile athletic tournaments. Russia is no exception in this regard, but the country’s geopolitical background has contributed to Russian sports culture becoming one of the most intense in the world. Though Russian athletes first gained worldwide notoriety under the Soviet Union, sports in Russia got started under the tsarist regime. Russian athletes competed internationally as early as the 1900 Summer Games in Paris. There was, however, a stark class divide in sports. 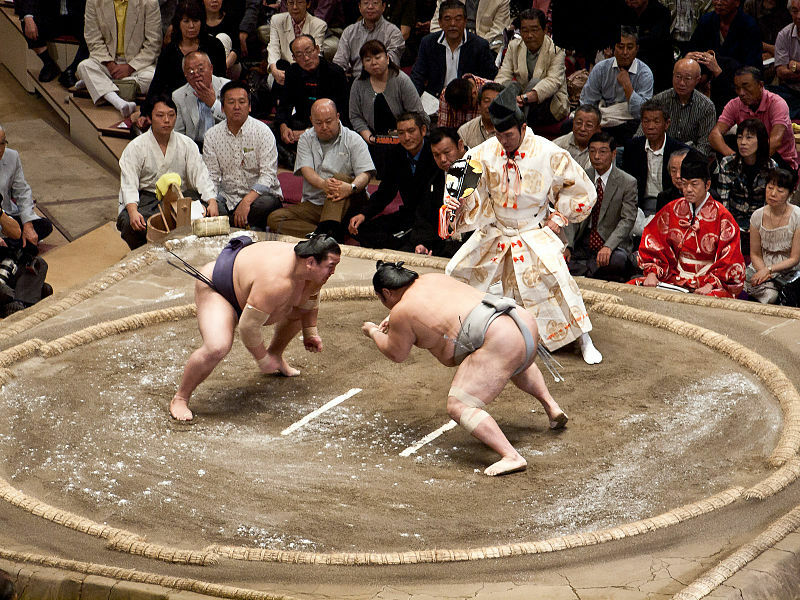 While military officials and aristocrats enjoyed elite sports such as figure skating, fencing, cycling, and tennis, team sports like soccer had much more revolutionary undertones. The earliest soccer societies sprung up in Russia in the 1880s and, in addition to providing a chance for their members to play, were also important bases for young workers to discuss revolutionary ideas. 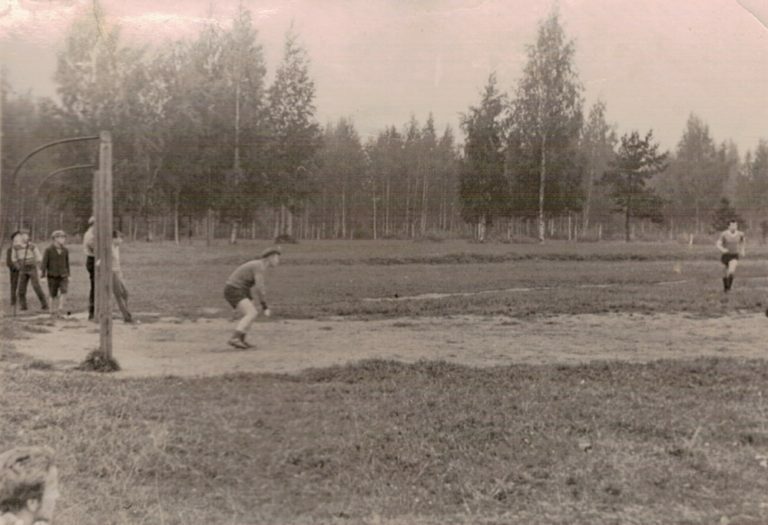 Soccer practice in St Petersburg in 1910. Source. The first official preoccupation with sports happened after Russian athletes failed to bring home any medals following the 1908 and 1912 Games. Embarrassed by this defeat, Tsar Nicholas II appointed a government office dedicated to supporting the fledgling, community-organized sporting societies of Moscow and St. Petersburg. Soccer was already becoming something of a peoples’ sport at the time, with some games drawing crowds as larges as twenty thousand. These two ideas, sport as a tool of revolution and sport as a tool of national prestige, would come to reverberate through Russian and Soviet athletics for the next hundred years. Following the 1917 Bolshevik Revolution and the Soviet Rise to power, the modest beginnings for Russian sports met with considerable setbacks. In the earliest years of the Soviet Union, the brand new government was too busy collectivizing the land and eradicating institutions of bourgeois decadence to dedicate any real resources to organized sport. Sport was, however, extensively discussed and analyzed during this time. Socialist ideology was supposed to extend to all aspects of private and public life, and citizens’ bodies and leisure activities were no exception. 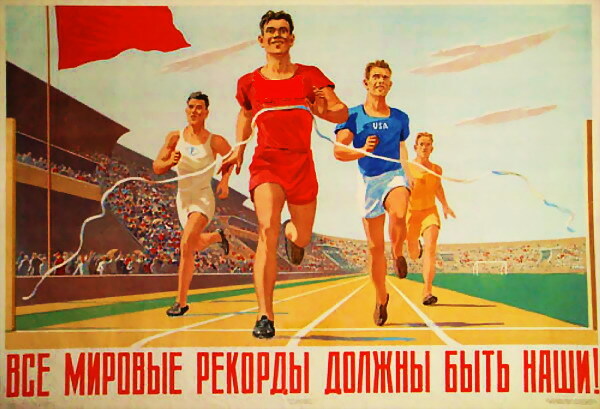 Though relatively little money was allocated towards developing state-sponsored programs for athletics during these times, Soviet thinkers debated how sport could be used as an ideological tool to teach citizens community- and team-minded values, and to strengthen armed forces and workers. At the beginning of the ’30s, the rest of the world was becoming crazy for sports. The first ever World Cup was held in Uruguay in 1930s, and worldwide interest in the Summer and Winter Games was growing. 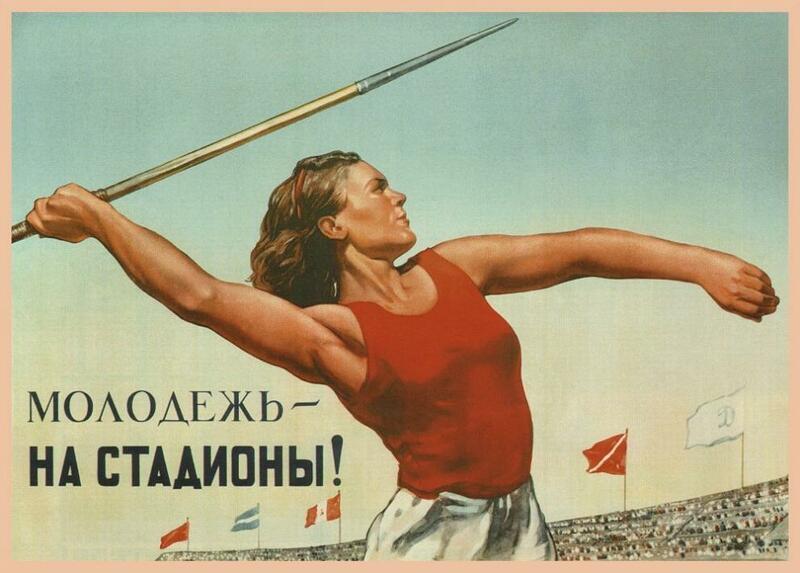 Seeing how athletics had evolved into a symbol of national strength, Soviet officials began to get serious about flexing their muscles. The Soviets built out extensive propaganda campaigns around sport and funded community centers, athletic fields, and organized leagues. In addition to these community-based efforts, the Soviet government began scouting young talent. Promising young athletes were sent off to special sporting schools where athletics became their profession: their housing, travel, meals, equipment, and education were completely subsidized by the state. Families of such children were also well compensated with special privileges like better housing, or western foods and clothing. Soviet efforts to train incredible athletic talent truly payed off in 1952 at the Helsinki Summer Games. Competing for the first time under the flag of the USSR, the Soviet athletes amassed 71 medals, second only to the USA’s 76. Despite their incredibly impressive finish, official state media seemed unsatisfied with second place and touted that the USSR had “won” the Games by amassing more medals than any other country. After the international community called them out, they revised headlines to read that the USSR and USA had tied. The next time around, the state-sponsored press didn’t even need to lie. The USSR went on to amass more medals than any other nation at the 1956 Summer Games in Melbourne and the Winter Games in Italy. For every Summer and Winter Games that the USSR competed in until the nation fell, they ranked either first or second in the medal count. 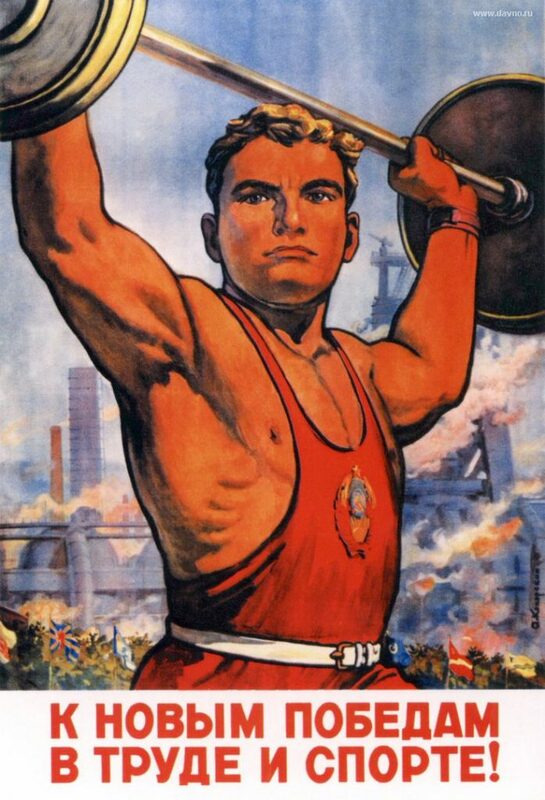 Sports in which the USSR particularly excelled were gymnastics, weightlifting, wrestling, volleyball, figure skating, and ice hockey. International athletic competitions were an important ideological battleground during the Cold War. The Soviet successes at the Summer and Winter Games did a lot to boost their international perception as a superpower. Tensions were high between the USA and USSR during this time, and much of that animosity bled into the bidding process for the Games: the USA boycotted the 1980 Summer Games in Moscow, then the USSR boycotted the 1984 Summer Games in Los Angeles. After the fall of the Soviet Union, the former Soviet states came together to compete in the 1992 Winter Games in Albertville and Summer Games in Barcelona as the Unified Team. Despite the political chaos happening in their countries, the athletes were as formidable as ever: the Unified Team finished second and first respectively in medal rankings. 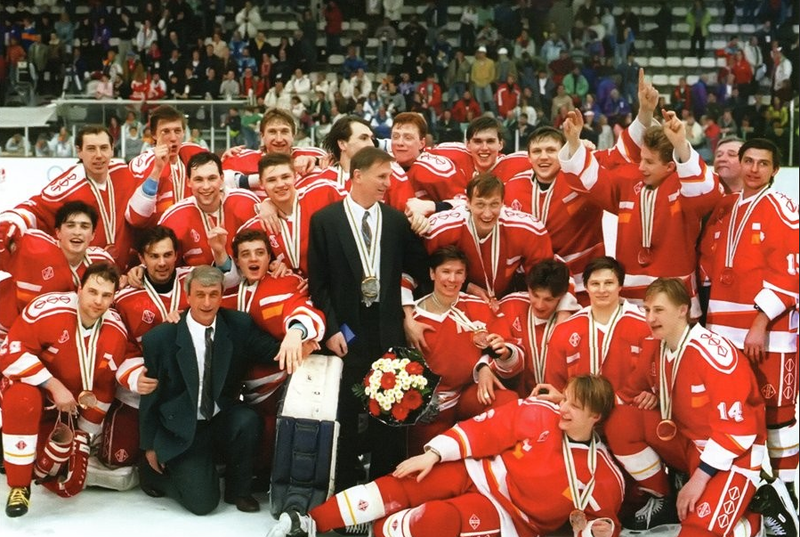 The Unified Men’s Hockey Team wins gold in 1992. Source. When it came time for the 1994 Winter Games in Lillehammer, Norway, many speculated how Russia and the former Soviet states would perform under their own, newly independent flags. That year, its first as an independent nation since 1912, Russia ended up going home with more gold medals than any other country. This promising finish in Lillehammer did not, however, lead to a continued winning streak in the coming years. Though Russian athletes continued to perform incredibly well in many of the fields they traditionally excelled in, their medal counts slowly declined, with their ranks sliding to second, then third, then fourth as the Summer Games progressed into the 2000s. At the 2010 Winter Games in Vancouver, Russia placed an embarrassing 11th in overall medal count. Canada beats Russia 7-3 in the Men’s Ice Hockey Quarterfinals, an upsetting loss for the Russian team. 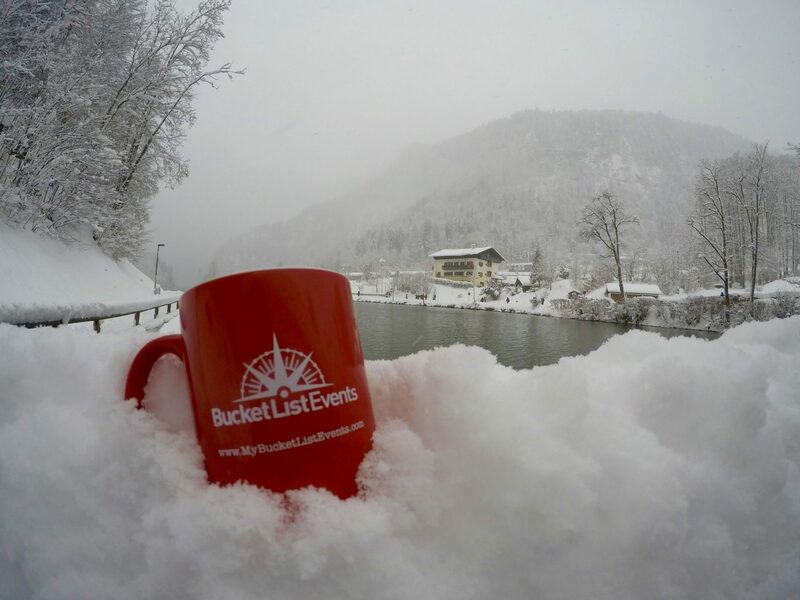 Vancouver was a deeply humiliating defeat for the Russians, who were slated to host the following Winter Games in Sochi in 2014. Where in previous years their declining medal count had largely been perceived by the public as unfair judging, this time the athletes were seen as under performing. Determined to ensure that such a defeat not be repeated on Russian soil, President Dmitri Medvedev launched a massive audit of official athletic programs. The audit cited dozens of instances of cronyism and corruption: apathetic sports managers, gross misspending by higher-ups, and dysfunctional bureaucracy. The results of the audit laid out a daunting task for Sports Minister Vitaly Mutko. With the Sochi Games just shy of four years away, he had to fix the entire crumbled infrastructure of Russian athletics. The 2014 Winter Games in Sochi showed a huge turnaround for Russia: their athletes won more medals than any other country, and on their home soil too. So how exactly did Mutko manage to craft such a tremendous comeback? The answer: systemic doping, encouraged and hushed by officials at the highest levels of the Russian Sports Ministry. In the wake of the conspiracy coming to light since 2014, 11 of Russia’s 33 Sochi medal winners were stripped of that honor. The doping scandal went on to mar the 2016 Summer Games in Rio de Janeiro as well as the 2018 Winter Games in PyeongChang. A Doping Control station in Sochi during the 2014 Winter Games. The current state of Russia’s national athletic programs is drawing well-deserved scorn from around the globe. But given the intense pressure that Russian and Soviet athletes have carried for many decades, it is understandable how such an elaborate scandal could come to be. With growing nostalgia for the days of Soviet athletic dominance and the intense intrigue that their former champions ignited around the globe, Russia has big shoes to fill. Since the days of the Soviet Union, Russian sports certainly haven’t eased up in their intensity, just fallen from grace.